A recipe for a spicy shrimp dish made with tomatoes, onion, wine, and spices. 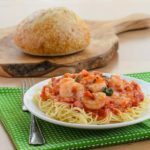 Shrimp Fra Diavolo is served over angle hair, spaghetti, linguine, or fettuccine pasta. In a large skillet, heat 2 tablespoons of olive oil over medium-high heat. Add the shrimp and sprinkle with salt and pepper. Saute the shrimp, tossing to cook evenly, until just cooked through (about 2 to 3 minutes). Transfer the shrimp to a plate and set aside. Add 1 tablespoon olive oil to the skillet if needed. Reduce heat to medium. Add the onion and cook until translucent, about 5 minutes. Add the garlic and cook until fragrant, about 1 to 2 minutes. Add the tomatoes and their juices, wine, red pepper flakes, and oregano. Stir to combine and bring to a boil. Reduce heat to low and simmer for 20 minutes or until slightly thickened. Return the shrimp and any shrimp juices from the plate to the skillet. Stir the shrimp into the sauce and cook for 1 minute. Stir in the parsley. Adjust seasoning with salt and pepper to taste. Serve over angel hair, spaghetti, linguine, or fettuccine pasta. The amount of garlic and red pepper flakes you use depends on your taste preference. Use more garlic if you prefer more garlicky flavor. Likewise with the red pepper flakes, the more you use will increase the spiciness of the dish.